I actually attended this funeral/memorial for children’s writer Diana Wynne Jones over 2 years ago. I had meant to write about it for a long time, but I didn’t want to write anything without having the programme of speakers from the event to hand, and it stubbornly disappeared until recently when I had a big clear out of papers (and faded with some print rubbed off after 2 years), so here it is. Diana was my favourite writer growing up. A few years ago I made a zine about her books (you can see/order the zine here, and there will be a new reprinted/re-layed out edition very soon), and Diana was kind enough to answer my interview questions in great detail (you can read the interview in full here) and various people contributed essays. Sadly, I didn’t get the zine finished in time for Diana to see it, because she died of cancer. Terrible procrastinating. The family had a private funeral, and then a year later had a public memorial in Bristol, where she had lived. An editor from one of Diana’s publishers named Sharyn November sent me an invitation, because she’d seen the zine, so I booked a cheap bus ticket and took myself off to Bristol. I considered inviting someone, but my then boyfriend had never read any of the books, and the two people I thought might be interested had both recently given birth (and one was living in Scotland). So I went alone. The plot of one of Diana’s most popular books (and my favourite), Fire and Hemlock, starts out with the main character, Polly, accidentally gatecrashing a funeral as a child because she’s dressed in dark colours and no-one realises she shouldn’t be there. The funeral and the connection it gives Polly to the sinister Leroy family have long-running effects on her life, and funerals are a very important theme in the book. This time I was invited though, it wasn’t quite a funeral, and eating or drinking anything there wouldn’t unknowingly entrap me. It didn’t quite seem right to wear black like an actual funeral, but neither did it seem right to wear bright colours, so in the end I settled for a purple blouse and black dress. 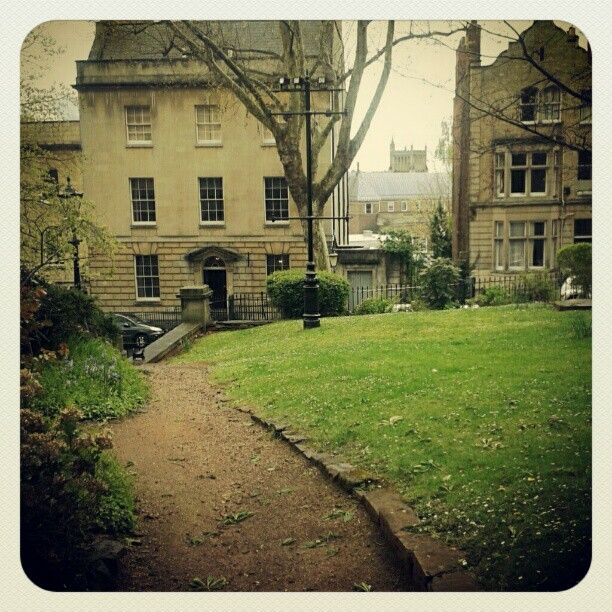 I really like Bristol, and know the city fairly well. When I was 18 I had a place at the university there, which due to a complicated and boring set of bureaucratic reasons I ended up not being able to start. The city just has a nice atmosphere (despite the steep hills and the wet climate- more on that later). On the two hourish bus journey I listened to Mogwai- Christmas Steps and My Father My King seemed appropriate, the former being named after a street in Bristol and the latter reminiscent of the Golden Bough, Polly in Fire & Hemlock’s reading matter on her ill-fated train journey to Bristol. I arrived in Bristol a couple of hours early, into a rainstorm. 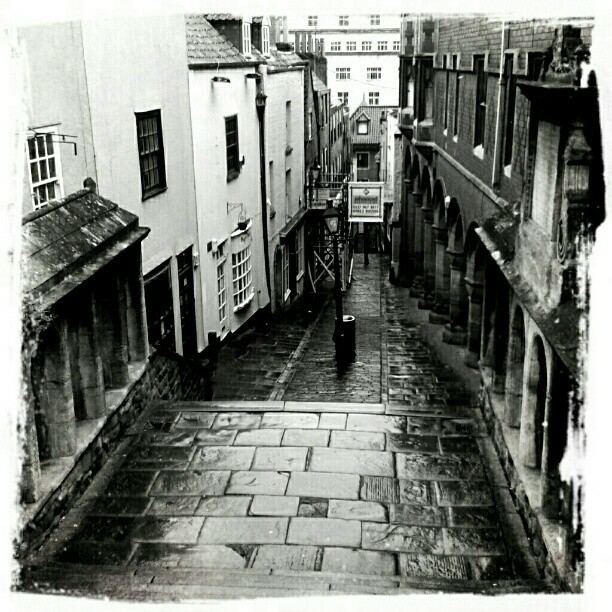 Bristol, like a lot of western coastal regions of the UK, has a very wet climate. At this point I realised I’d forgotten my umbrella, so I bought a very cheap one from a shop near the bus station. The cheap umbrella seemed ok initially, but the more I used it, the more I realised it was hungry for my blood, and would like nothing more than to skin one of my fingers. I managed to get through the day without shredding my hands, but every time I opened or closed the umbrella I had to do it very slowly and with great scrutiny. Onlookers must have thought I was very peculiar. I decided to find the venue first, and then go for a wander. The venue was easily found (on a route that went past Christmas Steps), and turned out to be really beautiful, a Greek Revival church from the 1820s now used as a concert hall. The nearby streets are full of solid old stone houses, slightly damp, arranged around oddly flowing sloping roads. I decided to have a wander up towards the university, and then come back and have a coffee in one of the nearby cafés before the event started. Whichever direction you go in Bristol, it seems to be uphill somehow. I think M.C.Escher laid out that city. As I was trudging up the steep slope of Park Street, which seems to form right angles to slopes at other angles somehow, the rain started again in earnest. A mini tidal wave of rain suddenly sloshed down the street, and me and another woman walking along the street had to suddenly jump over some water. We looked at each other and burst out laughing. I slogged around in the rain a bit looking at nice old buildings, but in the end I just sat in a cafe until it was time to go in. Once the venue opened I got another cup of tea and had a look at the displays. There was a small exhibition of hand-written first drafts of books, and various covers over the years. The family also had a cellar-full of paperbacks of various translations of the books. They had made a huge tower/pyramid of Babel of the books, and you could put your name on a post-it and reserve them for later, putting some money in the charity bucket in exchange. I put my name on a few Spanish ones, because at the time I wanted to brush up on it. Diana’s family members talked and gave their various perspectives on her work and as a person, and her bizarrely awful parents and eccentric upbringing. One of her sons had sometimes had a difficult relationship with her, and it was interesting to hear that Seb in Fire & Hemlock owed a lot to him as a teenager. The other speakers were friends and/or connected with Diana in various professional capacities. I won’t attempt to summarise the talks several years down the line, but they were all very interesting, and I wish there was somewhere I could read them again. There were also interludes with clips from the film version of Howl’s Moving Castle, tv version of Archer’s Goon (now available in full on youtube! ), piano music from a stage production of Black Maria, and a message from Hayao Miyazaki. I think my favourite talk was from Gili Bar-Hillel, an Israeli translator who has become a bit of a celebrity in her home country for translating Harry Potter. She grew up in a bi-lingual family, reading mostly in English because there wasn’t a great selection of children’s books available in Hebrew at that time. As an adult she decided to specialise in translating children’s books because she felt that a lot of the translations then available were dull and literal-minded and wouldn’t inspire children to read. She talked about the challenges of translating books between two very different languages, and how do you deal with translating something like Diana’s books where the same word often gets used in ways that can be interpreted in multiple ways- the example she gave was the Homeward Bounders, where bound could mean direction, restriction or obligation, and also brings to mind “bounder” as someone disreputable or the idiom “they’re bound to”, and where the book itself often deliberately echoes Milton or the Rime of the Ancient Mariner. It was really interesting. 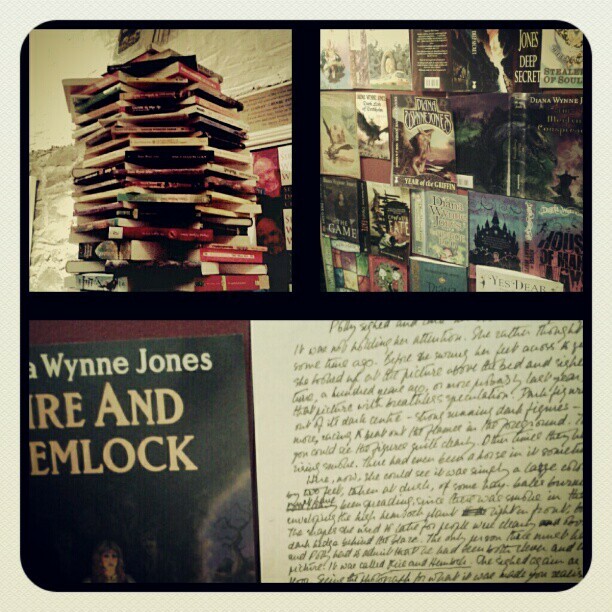 On the way out, I collected my Spanish books from the tower, or at least attempted to. It was at the top of the tower though, so it was a little difficult. Luckily one of Diana’s grandsons was at hand to help. He was at the sort of age where listening to a lot of speeches about his grandmother wasn’t too thrilling, but the chance to demolish a huge tower of books certainly was. Other people started asking if I could books from the pile, and before I knew it there was a bunch of people demolishing the books and sorting them into piles and going “do you think this one is in Dutch?”. I also had a nice chat with Sharyn before I had to leave to catch my bus back to London. Hello! I just have to leave you a comment thanking …uh, “thanking”?… you for alerting me that I can see the whole Archer’s Goon series on YouTube, that being one of my favorite DWJ books. Now I just have to find the time to sit and watch them all!